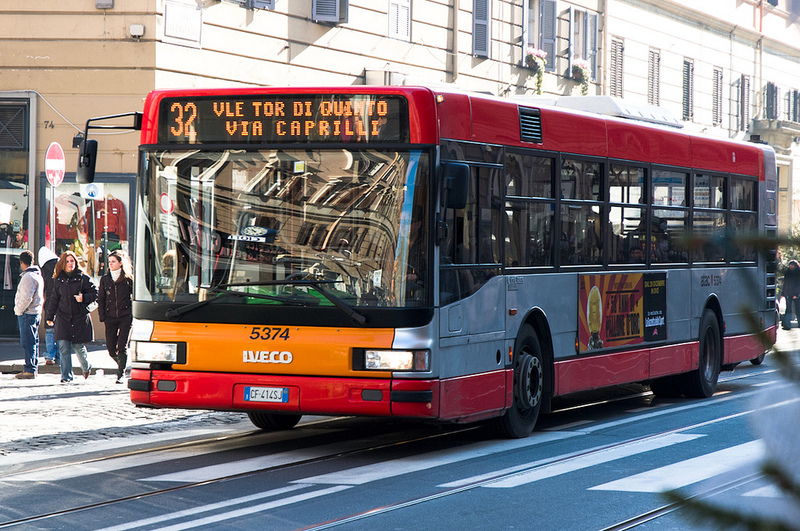 Each time the Agenzia del trasporto autoferrotranviario del Comune (ATAC) bus halted and then lurched forward, I gripped the safety loop hanging from the ceiling in the spirit of white knuckle riding. I still, however, ended up plowing into the Roman commuters. They seemed to have their own root systems flourishing on the hot, crowded bus. Actually, it was appropriate to stand like statues in the country that hosts three separate cast figures of David, alone, and these public transportation troopers oscillated and absorbed the shock of potholes, ruptured asphalt, as well as stop and go traffic with ease. While stuck in the urban crawl, the Roman riders, like any other big city commuters, appeared bored, tired and resigned to the haul. Fortunately, if I stood on my toes, pivoting slightly, I could look out the bus windows. The bastardized ballet stance was worth it since after turning a corner, there, right in the middle of Rome, in its massive ancient crumbling glory, stood the Colosseum. Jerking my head from the familiar view of the eroding edifice, I scanned the reactions of my fellow bus mates. I focused on one woman, in particular, who sat nearby in a seat with her back to the window. Do I tell her to turn around? She’s going to miss it. To my right, a couple debated a hot topic in loud Italian or perhaps they were just talking about what movie they would see later. I couldn’t really tell. Staring at them, I motioned my head slightly over my shoulder, indicating, “Over here, OVER here, don’t you see it?! What about the person behind me? He was reading a newspaper and casually leaning against one of the safety poles. Glancing up, he looked at me and then right back down at his paper. What news story could possibly be better than the view before us? All right, buddy — it’s your loss. I wanted to yell down the aisle — “Look at what we are driving by, people!” It’s freaking amazing — deteriorated yet distinguished! It’s an icon, for lord’s sake.” You know that Gladiators battled there, correct? I’m pretty sure against lions and other big cats. And, by the way, your emperors presided over various proceedings there for centuries. There was nothing. No “oooohing” or “ahhhing.” Just me screaming inside my head. Of course, these indifferent people passed by the symbol of ancient awesomeness every day. 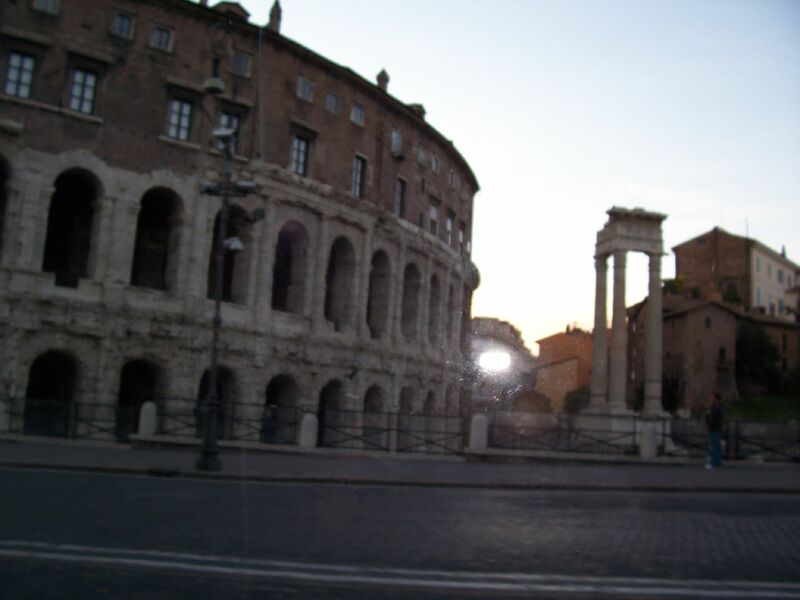 For me, spotting the Coloseum was like seeing the Eiffel Tower for the first time. A sight so recognizable it doesn’t even seem real. But sketches, history books, documentaries not to mention postcards, keychains, magnets, T-shirts, bookends, painted plates, embroidered wall hangings and decorative ashtrays have proven its existence. However, as I gazed at it until we turned a corner, I realized something even more familiar was missing. Indeed, perhaps the most striking feature of the Coloseum, I decided, after the initial thrill of spotting it wore off, was not the grand arches nor the supportive stone columns but what was notably absent. No scaffolding, no tarps and no “closed to the public” sign. 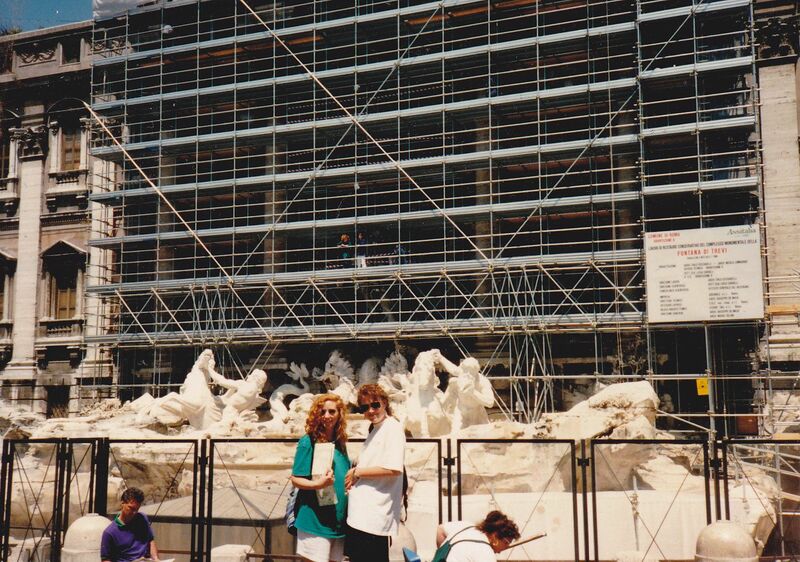 Since arriving in Italy, it seemed like every significant piece of art or architecture I hustled to see was under construction or being refurbished. If the art was not legitimately shrouded in a marble toga, it was draped with a canvas tarp and fronted by scaffolding — except, David by Michelangelo, of course, who was in his naked splendor. It started in Florence, which is home to the Duomo di Firenze complex, a UNESCO World Heritage site, which features the Cathedral of Saint Mary of the Flower, one of Italy’s biggest churches. Upon approaching the Duomo, it was easy to declare it one of the most beautiful cathedrals in the world — at least the the visible slivers between the scaffolding. The hawk distracts from the scaffolding, which you can see on the far right. I successfully took a photo without any scaffolding or tarp like coverings. While disappointed to see the structure partly obstructed, I certainly could understand the need to give the Duomo a proper cleaning and make necessary repairs. To get a decent photo without the scaffolding, I had to take a picture at an avant-garde angle. As a bonus, just as I snapped the photo, a hawk flew into view. Talk about framing the image; my photo in Florence definitely benefited from the scaffolding. My next stop, Rome, on the other hand, which seemed to be the focus of Italy’s makeover madness, concealed its sites more extensively. Take the Trevi Fountain, which is a tribute to Aqua Virgo, an ancient aqueduct named after a virgin who, apparently, discovered a fresh water spring. The site, appropriately, features a water theme complete with Neptune and his assistant tritons (mermen). I was eager to see the legendary, frequently filmed fountain. As a college student, like many other students wanting a “blow-off” course, I had enrolled in film studies and watched Federico Fellini’s infamous “La Dolce Vita.” Who wouldn’t want to visit the treasured Trevi after seeing the famous frolicking-in-the-fountain scene with Anita Ekberg and Marcello Mastroianni? In reality, it looked like a giant metal erector set balancing on top of the Travertine stone sea scene. Although one of the tritons (who represents the rough side of the sea) is genuinely trying to control a sea horse, it looked like he was fleeing to get the hell away from the crush of the steel. The other triton, representing the calm side of the sea, seemed to breathe a sigh of relief from his escape. Neptune, in his shell chariot, was nowhere to be seen. My friends Amy and Leah pose by the dry fountain. Neither was water, so that meant no coin toss, and ultimately, according to the tradition, no Roman return. However, I vowed to defy the prognosis since I needed to go back to Rome just to actually see that a fountain existed. Surely, visiting the Vatican would make up for not seeing the Trevi Fountain. Due to timing, a public blessing by Pope John Paul II — who, in the 1980s, was akin to a rock star, especially when he rode in his Popemobile — was not going to happen during my Roman holiday. Consequently, the next best thing to seeing PJP would be gaping at the Sistine Chapel and Michelangelo’s ceiling masterpiece. In Italy, I had discovered early on, it was easy to become overwhelmed by all the extraordinary history and art. I figured the greatest hits would suffice. Again, inspired by knowledge I had just gained from another college class — an art history course— I set out for the Vatican. After arriving, wandering around St. Peter’s Sqaure, feeling pretty Catholic, despite not actually being Catholic, I found out the not so shocking news. The Sistine Chapel was closed to the public due to restoration efforts. C’est la vie or, rather, in Italian Questa è la vita. Perhaps being disappointed by the other sites lowered my expectations, and that’s why I was so enamored by the Colosseum and the Roman Forum when I finally stood on their glorious grounds. But I don’t think so. They are simply magnificent. Just as gazing out at any ocean makes one feel small, standing in the presence of the Roman ruins prompts feelings of being small and young — like a child. This is good, however, because a child’s point of view is filled with wonder. But let’s face it, to a kid scaffolding is pretty cool, too. Here I am inside with my friends Leah (center) and Amy (right). This entry was posted in Europe, Italy, Travel, Travel Humor, Travel Oops and tagged Florence, Rome, the Colosseum, the Duomo, Trevi Fountain by stephglaser. Bookmark the permalink.